Coverage: Live on BBC Radio 5 live sports extra, plus live text commentary and report on the BBC Sport website. Australia's David Pocock and Israel Folau will return to the side for Sunday's World Cup semi-final with Argentina at Twickenham. Number eight Pocock (calf) and full-back Folau (ankle) missed last week's quarter-final win over Scotland but were declared fit to play after a full-contact training session on Friday. Prop Scott Sio (elbow) will be replaced by James Slipper. Loose forward Ben McCalman and utility back Kurtley Beale return to the bench. Vice-captain Michael Hooper will make his 50th Test appearance. The Wallabies were due to name the side on Friday morning for the Twickenham game but delayed the announcement for several hours so they could conduct a full-contact training session. 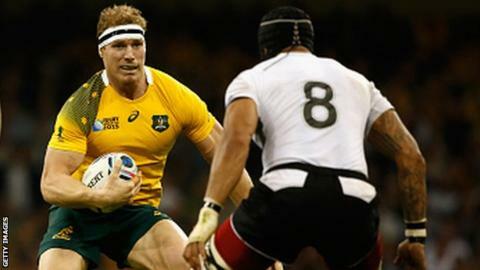 Slipper will play his 73rd Test, making him the most-capped prop to play for Australia. The 15 players have 876 Test appearances between them. "James has been pushing for a starting spot with his performances as a finisher and I know he'll take it with both hands," Australia head coach Michael Cheika said. "James is a leader in our squad and has performed well through this tournament so far and in the lead-up matches." Drew Mitchell retains his place on the wing, needing just one more try to draw level with Bryan Habana and Jonah Lomu as the all-time Rugby World Cup leading try scorer. The Wallabies are seeking to reach their first World Cup final since 2003. Australia head coach Michael Cheika said: "This weekend is a great opportunity for the lads to improve on last week and take advantage of the chance to play on such a big stage. "This weekend we want to make Australia proud of their team." Australia: Israel Folau, Adam Ashley-Cooper, Tevita Kuridrani, Matt Giteau, Drew Mitchell, Bernard Foley, Will Genia; James Slipper, Stephen Moore (captain), Sekope Kepu, Kane Douglas, Rob Simmons, Scott Fardy, Michael Hooper, David Pocock. Replacements: Tatafu Polota-Nau, Toby Smith, Greg Holmes, Dean Mumm, Ben McCalman, Nick Phipps, Matt Toomua, Kurtley Beale. This will be the third World Cup meeting between the sides, with Australia winning the previous two both by 13+ points. Argentina have reached the semi-finals in two of the last three Rugby World Cups. The Wallabies have won 10 of the last 11 Tests between the sides in all competitions; however that one win for Argentina did come recently, in 2014. Australia are playing in their sixth Rugby World Cup semi-final, only New Zealand have reached this stage on more occasions (seven). This will be the first time Argentina have ever played a Test match at Twickenham that has not been against England. Argentina have made more metres and offloads in the tournament so far, as well as notching up more defenders beaten than any other side.